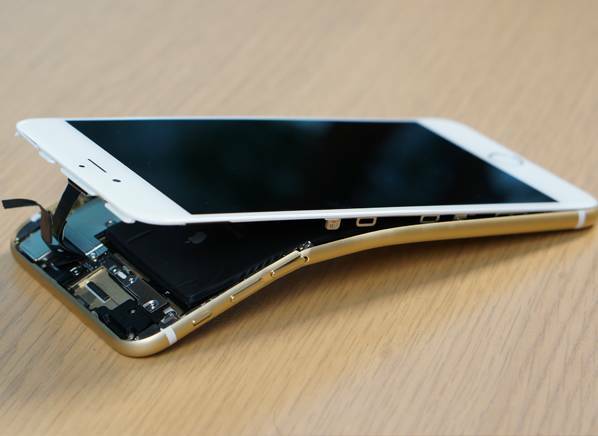 Apple's iPhone 6 and iPhone 6 Plus mobes do not bend out of shape quite as easily as was claimed by bloggers earlier this week, according - that is - to a more rigorous test carried out by Consumer Reports. The US product reviews outfit used its lab equipment to see if there were obvious design weaknesses in Apple's anodised aluminium-wrapped handsets. It ran the same three-point flexural tests on comparable smartphones and found that the iPhone 6 and iPhone 6 Plus were not as feeble as had been suggested in The Great Bendgate Controversy Of 2014. Consumer Reports explained that it stress tested the mobes by supporting them at two points on either end. Force was then applied at a third point on the top of the device. "We applied and measured the force using a high-precision Instron compression test machine. Along with the iPhone 6 and 6 Plus, we tested the LG G3, Samsung Galaxy Note 3, and HTC One (M8), and for those wondering about their old iPhones, we tested the iPhone 5 as well. We used one sample of each phone," it said. Apple is understood to carry out similar tests by applying up to 55 pounds of pressure to the handsets. Consumer Reports repeatedly ramped up the force it applied to the devices in 10-pound increments for 30 seconds before releasing it until the mobe hit "deformation level" and "case separation". Throughout most of our test, the LG G3 and Samsung Galaxy Note 3 bent, then recovered completely from each step up in force. But at 130 pounds, the case of the G3 fractured. At 150 pounds of force, the Note 3's screen splintered and it stopped working. Impressively, despite some serious damage from our Instron machine, some of the phones continued to work. Several of the screens illuminated and were functional to the touch; we even completed a call from one phone to another. A forlorn, very warped-looking iPhone 6 Plus having undergone the pressure test.